Planet Hell: Final Fantasy VI Advance Review. 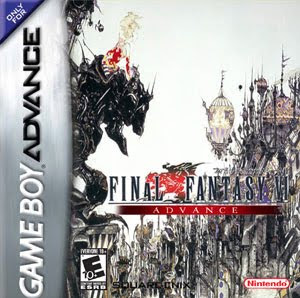 Ok, I thought I'd review Final Fantasy VI Advance (GBA) since I was quite impressed after recently playing through it as part of my Final Fantasy Challenge. Anyway, on with the review. The gameplay is quite solid. The game utilises the same ATB battle system as many of the other Final Fantasy games. There aren't that many refinements or quirks that set it out as being that different, however it still is good. Instead of basic summons/eidolons like in FFIII and IV, you have Espers (which there are a lot of), one of which can be equipped to each character at a time. They can be summoned once per battle for decent support, healing or offensive attacks, and after the battle is over, you get exp and magic AP, which goes towards the magic you learn from that equipped esper. So you can learn magic and get permanent stat boosts from each level as a result of the espers. I really liked the esper system in this game, and it was what I spent most time grinding on to improve my characters. Perhaps it makes the game slightly easy however, as even my weaker characters(which had much lower stats than my main guys and slightly lower levels) could still do really decent damage against the end game enemies and bosses with overpowered spells like Ultima. These are probably the two aspects of FFVI Advance that impressed me most (although I really enjoyed the music as well.) From the start, the story involves Terra and some Imperial soldiers marching across a plain to the town of Narshe. They are heading there to find a frozen esper. The Espers have quite an important part in the story and the schemes of the Emperor and Kefka. As the game goes on, Terra finds it strange that she has no memories. She comes into contact with Locke and he introduces her to the Returners, a group of militants opposing the 'evil empire.' From there she decides to join them and the story goes on from there. There is a lot of dialogue, which is very well written and it keeps the story strong throughout. I really like the style of the writing as well. Here's the opening passage. world. Could anyone truly be foolish enough to repeat that mistake?" The characters have quite a bit of backstory and depth to them, there are quite a few characters I like. From the depth that comes from Terra's past with the empire(involving brainwashing and their exploitation of her), to the relation between Sabin and Edgar and the throne of Figaro, there are a lot more characters, most of which are quite well developed (perhaps with the exception of Umaro and Gogo). There are 14 playable characters in total, I thought this was slightly too many. I mean, I know choice is a good thing, but at the end of the game, you need to take 3 seperate teams of up to 4 into Kefka's Tower. So this means you more or less need to grind out a lot of spells, abilities and levels onto characters you might not necessarily like. Still, the story and characters were two aspects of the game I really liked. One thing I like about the game is the settting, its different from some of the other Final Fantasy games in that it is set in a steampunk world in which magic and the espers are important. We are told about the War of the Magi in the past, which wreaked havoc on the world and now steam power is prevalent, with machines all across the world. Gestahl and Kefka are seeking to find a way to infuse magical energy into their machines of war. From there, Terra becomes an important part of the story, as do the Espers. I haven't played either the SNES or PS1 version of the game, so can't really compare them at all. Anyway, I would always treat a GBA game as a GBA game, not as a remade SNES game when it comes to reviewing. So, for the FFVI Advance remake, they touched up the graphics, making them work on the GBA. The 2D sprites in battle look really good, especially when you cast support effects like Vanish, Haste, Protect, Shell etc on them. I was amazed fighting the end boss, the sprites are really gorgeously drawn. In combination with the music, you feel like you are fighting a deity. The only times the graphics felt bad to me were the cutscenes when the airship flies through caves, across the world, or when you are on chocobos. The capabilities of the GBA in those cutscenes feel quite inadequate at those points. At times, you can't really tell what is going on. Still, thats only a handful of times throughout the game, otherwise, the graphics are pretty good. As far as the sound quality on here is, its a GBA game so some of the compression to fit everything on the cart means the quality is affected compared to say, the PS1 version. Still, apart from the Opera scene when the voices seemed a bit funny, it didn't really ever bother me. The tracks on this game are pretty damn good. It has a lot of good songs-I'd say it has a better soundtrack than VIII and probably IX, just as a comparison to the other FF games I've played recently. Terra's Theme, Dancing Mad (which is AMAZING during the final battle) and Darkness and Starlight (the opera theme) are some of the ones that stick out in my mind as being really good. As far as I can remember, the music fits all the locations in the game quite well, really adding to the feel of the game. Overall, its a pretty damn good game. Sure its not the most original story, or gameplay system, but there are few flaws in this game, and everything adds together really nicely. Definitely give it a try if you haven't. I'd say it goes straight in to my top 3 favourites of the Final Fantasy series. not only for me the best FF in entire saga, also the characters are the best in all the saga, my favorite character is Celes Cher.